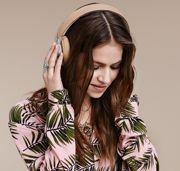 Bang & Olufsen adds H3 earphones and H6 headphones to B&O Play line | What Hi-Fi? New from Bang & Olufsen are two new headphone models in its B&O Play line-up: the H3 in-ear model, selling for £199/€249, and the £329/€399 H6 on-ear, which combines B&O's traditional anodised aluminium with leather and lambskin. The new headphones are the work of Danish designer Jakob Wagner, working in conjunction with the acoustics and electronics experts at the company's HQ in Struer, Denmark. They were launched this evening at a special event at London's Fabric club, held in association with Universal Music's Yellow Lounge crossover classical events. Presented by Bang & Olufsen CEO Tue Mantoni, who introduced both the headphones and, with Universal Music Group boss Max Hole, performances by guitarist Miloš and pianist Valentina Lisitsa, the new headphones are aimed at 'people who don't want to listen to music using little white earbuds', as Mantoni told his audience. The H3 earphones use 10.8mm drivers in milled aluminium housings, available in silver, red and black, and the housings are drilled with 23 ventilation holes, tuning the headphones to give an open soundstage. The headphones weigh just 12.8g, and come complete with a 1.35m cable with a three-button inline remote and microphone for use with iOS devices. The H6 headphones are built from aluminium and leather, available in either natural finish or black, with lambskin ear-cushions using memory foam to shape themselves to the user's ears. Mantoni explains that the leather is sourced from New Zealand, as farms there use no barbed wire, and thus the leather has no cuts and scratches, and is designed to age and change colour in use. He adds this means it will take on a patina over time, 'showing what you and your headphones have been through together'. Weighing just 230g, the H6 headphones come with both three-button and single-button cables, plus spare ear-cushions, and have inputs for the cable on both left and right earpieces, plus the ability to daisy-chain an extra pair of headphones using the 'spare' socket. They use 40mm drivers, and like the H3s will be available from next month from Bang & Olufsen stores, the B&O Play online store, selected Apple retail stores, Apple Online, and selected design and department stores.